Ahh, the good ol’ turkey burger. Popularized during the low-fat 90s and then coldly abandoned, along with Snackwells cookies and Lay’s WOW! chips. Turns out, turkey burgers have not lost their place in California. They’re still on restaurant menus, like, a lot. And not in the “substitute turkey patty” kind of way. They’re given prime menu real estate, made with artisan brioche buns, and topped with things like arugula, port cheese, truffle aioli, sun-dried tomato pesto — I mean. There are gourmet turkey burgers galore in Los Angeles. I guess it’s my turn??? 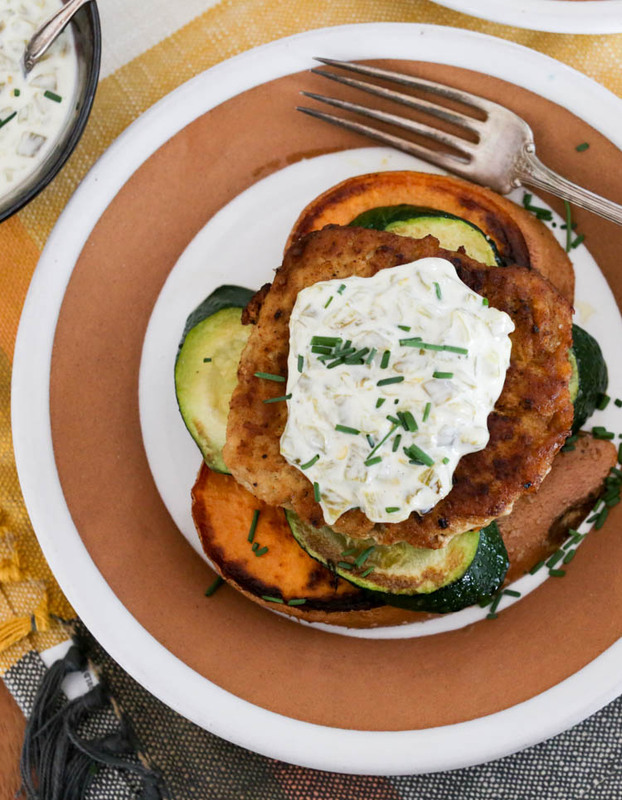 These turkey burger stacks not only have a cute name that might remind you of another 90s hit, Jenga, they also fit the bill for our current interpretation of the word “healthy” because they are low-carb and grain-free. 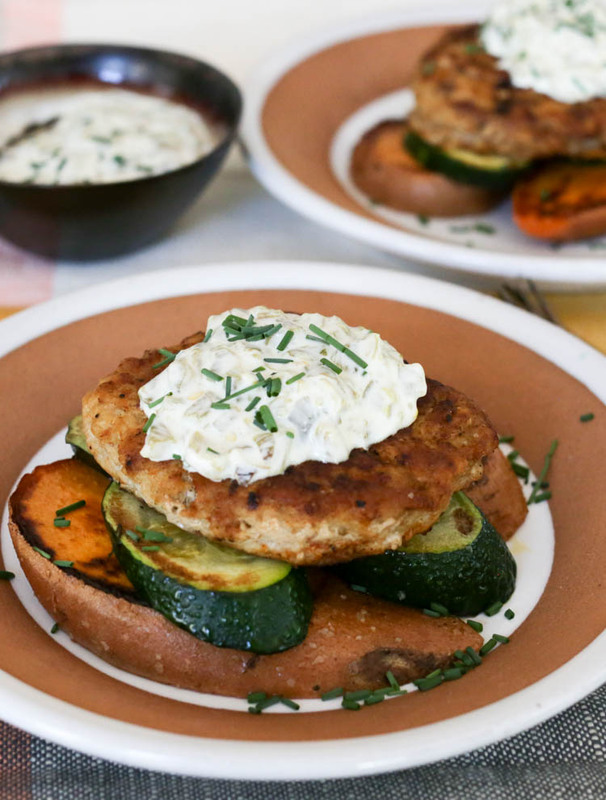 Pan-fried slabs of sweet potato topped with (optional) zucchini and a spiced turkey burger patty, then you slap some totally-not-low-fat sour cream sauce on top. S’good. Real good. When I make this for family dinner, I leave out the zucchini. Chris is not a fan of that squishy squash and after 7 years I have finally stopped trying to get him to like it. And if I’m being totally honest, I also like this better without the zucchini — the sweet potato and burger and chili-sour cream is so good together! — but I have a sort of a rule for myself that I need to eat at least one green vegetable with every meal. So when I make this just for me, I add the zucchini. Also, the zucchini makes it a prettier, more colorful plate. If you opt out of zucchini but still want a green vegetable, this goes fantastically with spicy broccoli salad or garlic green beans! And you might think it’s weird how I wait until the very last second to season the turkey burgers, but it’s an old, old trick (my salsa turkey burger recipe video is over 5 years old so it’s at least that old) that totally works. You end up with a nice spicy crust outside the patty and a super juicy inside, even if you use lean ground turkey. Try it! You’ll be amazed. Almost as amazed as you were the first time you read the warnings on the bag of WOW! chips and realized that the FDA knowingly approved a food that makes you feel like you got food poisoning. Shape the turkey into 4 patties and put them on a plate in the fridge. Do not season yet. In a small bowl, mix together 1 teaspoon of salt, black pepper, garlic powder and paprika. 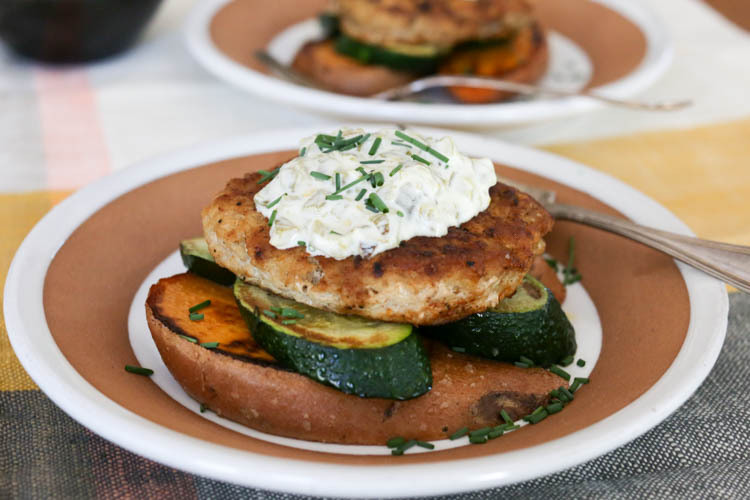 Set aside to season turkey burgers later. If using fresh Anaheim chiles, place on a baking sheet or broiler pan and broil on high for 2-3 minutes on each side (8-10 minutes total) until blistered and dark. Remove and let cool to handle. Once cool, peel off the skin (remove the seeds/membranes if you want) and mince the chiles. Mix with sour cream, lime juice, chives and about 1/2 teaspoon salt. Refrigerate until ready to use (this will keep several days in the fridge). Slice the sweet potato 1/2″ thick. Try to get 8 slices about the same size each. Cut the zucchini into 12 slices. Heat 1 tablespoon of the oil in a large skillet over medium heat until shimmering. Add the sweet potato and cover. Let cook for 2-3 minutes. Flip and cover again. Cook 2-3 minutes or until barely tender and browned. Be careful not to let them burn. With a higher sugar content, sweet potatoes are more likely to burn than regular potatoes. Sprinkle with about 1/2 teaspoon salt. Arrange sweet potato slices on plates (2 per serving). In another skillet, heat the remaining 1 tablespoon oil over medium-high heat. Get the turkey burgers out of the fridge and sprinkle the seasoning mix evenly over both sides. (Tip: seasoning the outside only, and just before cooking, creates a crispy crust on the burgers and keeps them juicy) Carefully place in the hot skillet and cook for 3 minutes on each side or until well browned and the juices run clear. While the burgers cook, turn the first skillet back on the heat and add the zucchini slices. Brown them on medium-high for about 1 minute each side. Sprinkle with salt. Layer zucchini on top of potatoes. Once burgers are cooked, stack them on the zucchini. Serve with a dollop of sour cream sauce. Going to give this a try. Up to my arm pit in zucchini from the garden and can get the turkey and sweet potatoes at the store. I think it will be a great change from beef and chicken.